Philippine President Rodrigo Duterte and Malaysian Prime Minister Mahathir Mohamad at a welcoming ceremony at the Malacañan Palace grounds on March 07, 2019. MANILA, Philippines — Malaysia is upbeat about the creation of a new Bangsamoro region in Mindanao and is hopeful that the peace efforts in the southern Philippines will lead to a more robust economic cooperation. 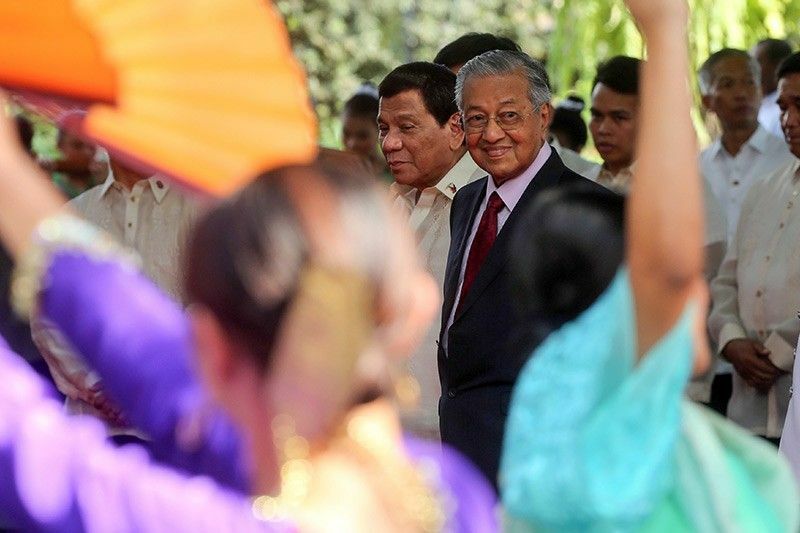 Malaysian Prime Minister Mahathir Mohamad said Malaysia would continue to help the Philippines promote development in Mindanao, which has been plagued by armed rebellion and terrorism. "Given the vast economic potential of this area, I believe with the establishment of the Bangsamoro Autonomous Region of Muslim Mindanao or BARMM, we have to boost economic ties between both countries. I, therefore, assured Mr. President of Malaysia’s desire to continue to be of help in the development of Mindanao," Mahathir said after a meeting with President Rodrigo Duterte Thursday in Malacañang. "I congratulated President Duterte on the success of the ratification of the Bangsamoro Organic Law and the appointment of members into the Bangsamoro Transition Authority. I look forward to the smooth transition of the ARMM (Autonomous Region in Muslim Mindanao) through the interim government of the Bangsamoro Autonomous Region for Muslim Mindanao," he added. The Bangsamoro Organic Law, which created the BARMM, was ratified by Mindanao voters in two plebiscites held this year. The BOL is the product of the landmark peace agreement signed by the government and the Moro Islamic Liberation Front in 2014. The new region will replace the ARMM and will have greater share in national government revenues. The BTA, which has 80 members, assumed leadership over BARMM last February 26 and will serve as its interim regional government until June 30, 2022. Duterte and Mahathir also discussed bilateral trade, which the Malaysian leader described as "increasing" but "largely in favor of Malaysia." The Philippines is Malaysia’s 15th largest trading partner globally and its fourth largest trading partner among members of the Association of Southeast Asian Nations. "I believe there is still room for improvement and from my meeting with Mr. President, we would encourage private sectors from both countries to explore opportunities of collaboration and venture in new cooperation and investments," Mahathir said. "The president and I strongly believe that trade and investment through between the two countries could be further strengthened in the coming years," he added. The 93-year old leader said Malaysia and the Philippines have been actively involved in the Brunei Darussalam-Indonesia-Malaysia-Philippines East ASEAN Growth Area and could use the regional cooperation as a platform to assist the Mindanao Development Authority. "I highlighted that Malaysia has been a favorite healthcare destination for the Philippines. The number of patients from the Philippines seeking treatment in Malaysia has been increasing over the years," the Malaysian leader said. Mahathir said Malaysia is also committed to taking the necessary steps to address terrorism and violent extremism through the Trilateral Cooperation Agreement. Under the agreement, the Philippines, Indonesia, and Malaysia will conduct unilateral maritime and air patrols to combat common threats.